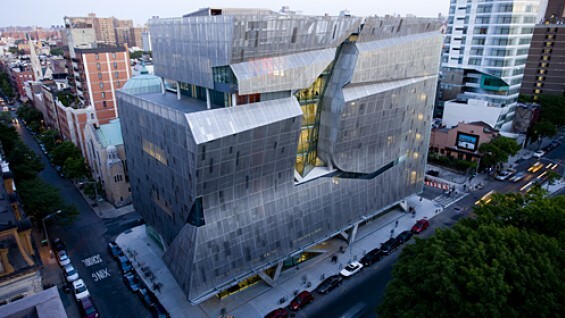 In September 2009, The Cooper Union opened 41 Cooper Square, a major new institutional facility. The building was designed by Pritzker Prize-winning architect Thom Mayne and his firm Morphosis, and features state-of-the-art laboratories, classrooms and studios along with conference rooms, lounges, 41 Cooper Gallery and the Frederick P. Rose Auditorium. It houses the Albert Nerken School of Engineering, the Faculty of Humanities and Social Sciences, the Louis and Jeannette Brooks Computer Center, The Herb Lubalin Study Center, The Saturday Outreach Program and provides student and teaching studios. In the fall of 2010, the U.S. Green Building Council awarded 41 Cooper Square the LEED Platinum rating, its most rigorous level of certification that acknowledges the building's array of green features which reduce energy use and enhance the environment. 41 Cooper Square is the first academic building in New York City to achieve the LEED Platinum status. The signage was designed by Pentagram. Read more in Architecture Daily and Architectural Record about the concept and construction of this building. 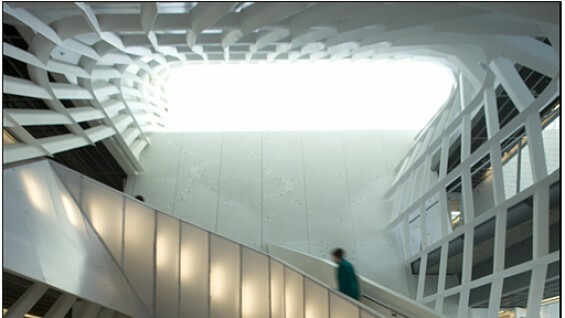 Click here to see upcoming public events at the 41 Cooper Square and the Rose Auditorium.